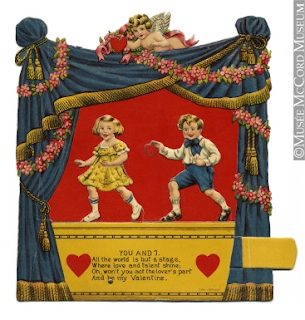 February is the month we pay homage to earthly love with red hearts, and cupids with bows. 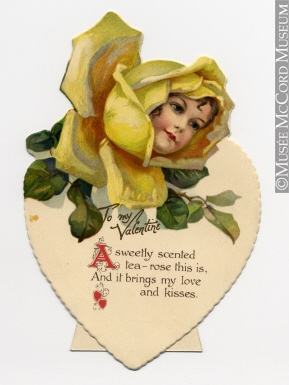 We send Valentine cards by mail, on line, and by hand - especially if you have kids with homemade Valentine collection boxes. But whatever happened to those cute little Valentines we used to send? They're hard to find amid the proliferation of licensed characters from well-known movies. I have to admit that I don't understand what Batman, Spiderman, etc have to do with love - earthly or otherwise, but I'm sure their creators' hearts are in the right place. You think? 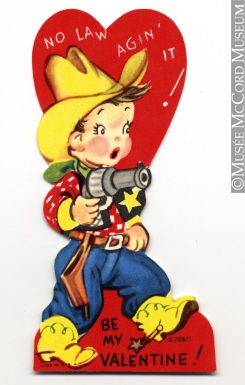 Want a closer look at the Valentine cards you see here? 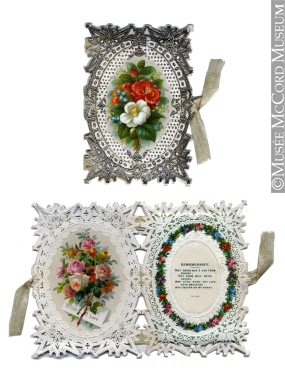 Click on the images and you'll be taken to the McCord Museum website where you can zoomify the designs to your heart's content. 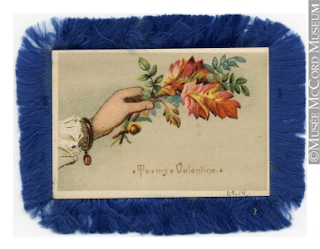 We've come a long way from the lace and feathers that decorated the Valentine cards of old. 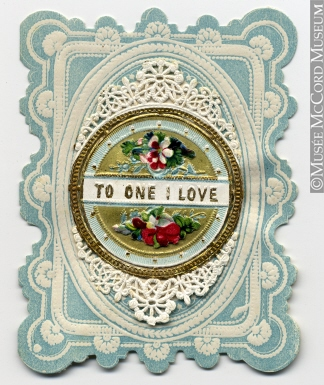 This year, I long to look back at those frilly, elaborate cards, and so chose the online website of the © McCordMuseum where Dorothy Cushing of Montreal donated her 120-card collection to share with us. 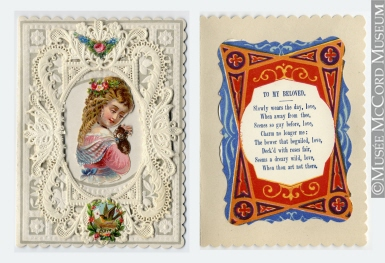 Come along and share the journey as I travel back to the years between 1880 and 1910 or more, and celebrate Valentine's Day with these creative cards. 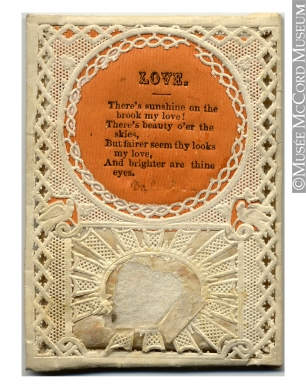 According to Pamela Miller at the © McCordMuseum, there was a reason these cards became popular: "The embossing process involved pressing the paper against an engraved die. The British papermaker Joseph Addenbrooke discovered by chance that by filing off the raised part of the embossed area he could produce a lacy effect. English lace-paper soon achieved world renown. 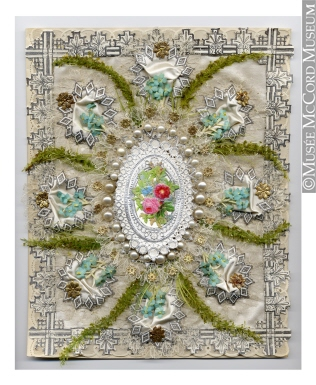 During the Victorian era, no embellishment was considered too ornate: simple designs on a single sheet of paper had evolved into creations including lace, silk, velvet, feathers and shells. The variety was endless." When thou are not there. Or sorrow’s tear my cheek had wet. Star of my bright and joyous youth. 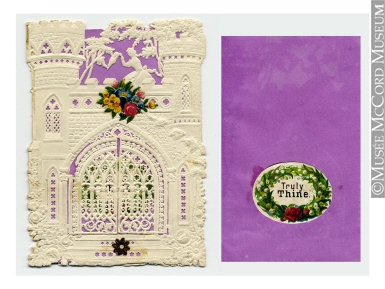 This next one is a similar design, but with architectural details which includes castle doors that open to reveal the sentiment. The next one appears to use an embroidery-like design on an open weave fabric as the center, while still using the white paper lace around it. 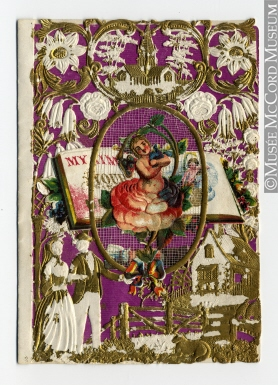 Most of these cards use a layering effect with the lacy paper lying on a base color, and then pictures added as embellishment. Meanwhile, this next one used a similar, but even more open weave. I like the overall design of this card, even with the heavy gold accents, but I don't like the paper cut-out in the center which seems tacky to me. Are Graven on my heart. There's sunshine on the brook my love! And brighter are thine eyes. This next one is an example of a tasteful design using beads and feathers for beauty and interest. The fringe on this next on, one the other hand, reminds me of a dust mop. Not romantic at all in my way of thinking. After all those ornate ones, this seems simple, yet I'm guessing it was a stand-up card from the background piece of thick paper. A sweetly scented tea - rose this is, And it brings my love and kisses. No Law Agin' It ! Be My Valentine ! Valentines are fun to send to loved ones, but we don't need a piece of paper - embellished and dressed up or otherwise - to let God know we love Him. And we don't need to wait for February to roll around either. God doesn't care for fancy trappings and witty words. Three little words of "I love you" is all it takes to let Him know what's in your heart. Do you like the new or older Valentines? Any of the ones listed here? Why? 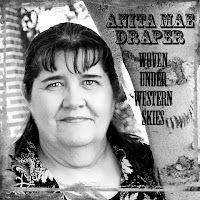 as always, a fun, informative post Anita! 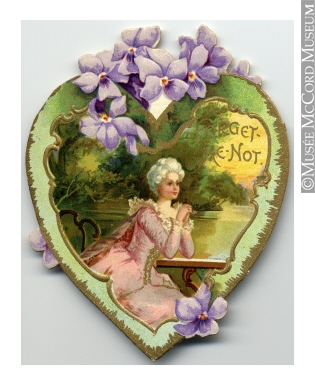 i like the old, ornate valentines over the newer "trendy" ones. looks like it took more work and involvement over - find a theme/mass production valentines for kids these days. Thanks, DebH. I'm part Scot, :) and have to admit that the first time I saw the word, bairn, I thought of the farm building. Speaking of homemade Valentines, many of these ones look that way when you zoomify them. I imagine they were not mass produced back then, and I can see they were created in layers. But sometimes the way the cupids and flowers were tacked on detrated from the overall effect. At least it seems that way to me, but then, I'm a perfectionist when it comes to crafting. What pretty valentines! They make all the ones at the store look quite plain. I don't know if I can pick a favourite though! You always do the most interesting posts, Anita! And I love these valentines. They remind me of when we used to decorate our shoe boxes and then pass cards out at school. That last one looks the most like the kinds of cards we had. My personal favorite, though, is the castle one. So pretty! These remind me of the ones we used to make with construction paper and the paper doilies. Prettier than the superheroes. But as a mother of boys, I can say they'd rather get the superhero ones when they're young. Wow, Anita. These are so pretty. I'm an old fashioned soul and these kinds of cards just call my name. I've always loved the nostalgic cards. Especially the Valentines. Oh, the card that you said looks like a dust mop - LOL. I like the card, but not the blue fringe. I imagine it's quite dusty by now. Eew. Yes, DeAnna. That last one is similar to ones I'm familiar with as well. The last time I went looking though, I couldn't find anything like it in the stores. Do you remember the ones that came in the big booklets and you had to punch them out? I always ripped one or two of them when they slimmed down to the paper ones. I much preferred the thicker ones. Yes, I like that castle too. Not as much the purple colour, but then it is supposed to stand for royalty, so there you go. I like all the lacy ones. LOL, CJ. I still have a box of Disney's something hanging around. I remember helping the boys go down the class list a few years ago, ensuring everyone was accounted for and all the names on the cards matched the ones on the envelopes. Heaven forbid the wrong girl got a card meant for another. This year, 17 yr old Nick was the only one doing cards. He took a whole package of the 2x3 inch cards and duct-taped them together on the back. Then put his girlfriend's name and his name in the empty spot in the front on every single one of them - 20 in all. He added a box of chocolates. And he even made a batch of pink heart-shaped shortbread cookies. He melted white candy melts in the 'melter' I got for Christmas and dipped one curve of each heart-shaped cookie in the white chocolate - a nice crescent shape on one side only, which he then sprinkled red sugar crystals on. We brought some to the church potluck yesterday and they disappeared so fast. Some people moaned that they didn't get any as others walked by with 2 on a plate. LOL. It was too funny. I took a pic and will post on my recipe blog soon. I agree, Suzie. Really nice idea, but what a dust collector. You can dust the other ones, but a thread/yarn fringe needs to be washed. I never knew the lacy ones were created by accident. I always have several of them in different sizes hanging around because they come in handy when I need a special looking plate for bringing somewhere. I always love your history posts, Anita Mae. You come up with the neatest things. 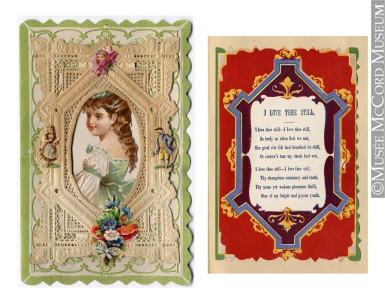 I have a few cards my parents received when I was born and they look just about as antique as these! There is certainly something special about the whole card and letter 'age' that seems to now be history. I have a drawer full of cute note cards myself, so I'm not helping. Thanks so much Anita. You always put so much effort into making fabulous posts and we know they stay popular out in cyberspace for a long time. 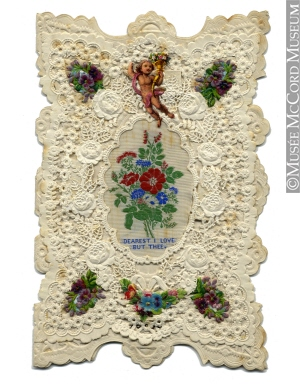 I hope you've inspired someone to try old-fashioned elegance with this year's Valentine card! Ditto what Deb said, Anita! I love your posts, even though I always seem to find my way to them late!